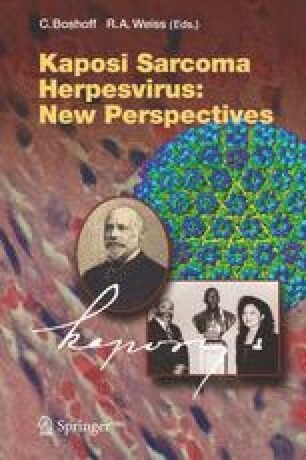 Kaposi sarcoma-associated herpesvirus (KSHV) is a γ2-herpesvirus discovered in 1994 and is the agent responsible for Kaposi sarcoma (KS), an endothelial cell malignancy responsible for significant morbidity and mortality worldwide. Over time, KSHV has pirated many human genes whose products regulate angiogenesis, inflammation, and the cell cycle. One of these encodes for a mutated G protein-coupled receptor (GPCR) that is a homologue of the human IL-8 receptor. GPCRs are the largest family of signaling molecules and respond to a wide array of ligands. Unlike its normal counterpart, the mutations present in KSHV vGPCR result in constitutive, ligand-independent signaling activity. Signaling by the KSHV vGPCR results in the elaboration of many mitogenic and angiogenic cytokines that are vital to the biology of KS and other KSHV-driven malignancies. Several other herpesviruses also encode GPCRs, the functions of which are under ongoing investigation. In addition, several human diseases are associated with mutated mammalian GPCRs in germline or somatic cells.